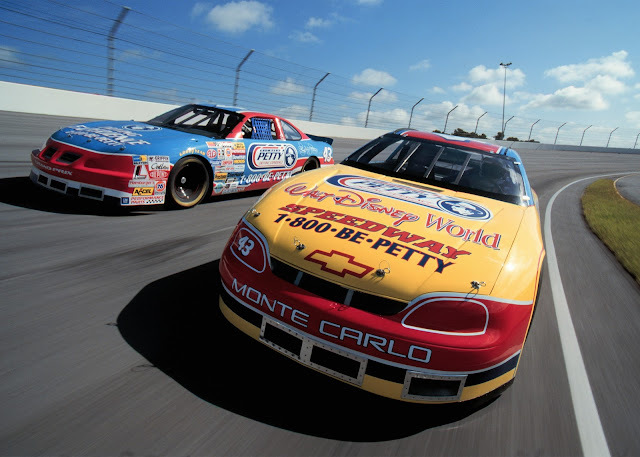 The Richard Petty Driving Experience at Walt Disney World Speedway is the place of dreams, offering race fans and adventure-seekers the ultimate thrill of riding in or driving a racecar around the one-mile tri-oval Walt Disney World Speedway. Guests are offered several ride and drive experiences as they follow their dream of leaving the grandstands and climbing into a racecar, just like The King himself. Ride-Along Program: A three-lap thrill ride as a passenger at a top speed of 145 mph. New! Junior Ride-Along Program: A three-lap thrill ride for 6- to 13-year-old passengers, who are at least 48 inches in height. Rookie Experience: A three-hour program that places guests behind the wheel for eight exhilarating laps around the track. King’s Experience: Features 18 laps of drive-yourself thrills divided into one eight-lap session and one 10-lap session. Experience of a Lifetime. Talk about pulse-pumping, thrill-seekers choosing this Petty track will experience 30 laps of white-knuckle, heart-pounding speed in a NASCAR race car. The “Experience” is divided into three 10-lap driving segments and between each session, drivers will receive one-on-one feedback from the Pit Road instructor Priced from $1,299 per person. Speedway Challenge. Imagine the high-octane rush of this one-of-a-kind driving program. This 50-lap program consists of five 10-lap sessions as well as a Ride-Along, shop tour with tech talk and lunch with the instructor and crew chief. Priced at $2,099 per person. Begun in 2012, the Junior Ride-Alongs program provides children, who are at least 48 inches in height, the opportunity to ride shotgun with a professional driving instructor for three thrilling laps in a specially equipped two-seat NASCAR race car. Richard Petty Driving Experience sessions at Walt Disney World Speedway run every other day with Ride-Alongs offered daily. Driving experiences are available for those at least 18 years of age with a valid driver’s license. All student drivers are accompanied by a professional right seat driving instructor who provides coaching and feedback throughout the driving experience, made possible by Stilo helmets that feature a built-in, two-way open-mic system. Fans at least 14 years of age can participate in the Ride-Along Program with proof of identification. For information or reservations, visit drivepetty.com or call 1-800-237-3889.